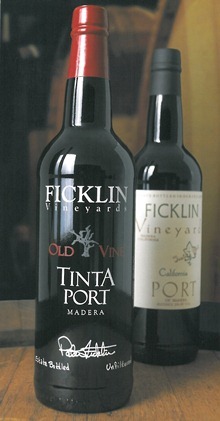 The flagship wine of Ficklin Vineyards – the Old Vine Tinta Port. Produced from a solera ageing system started with the first wines produced in 1948. Port wines made with traditional methods and authentic Portuguese grape varieties grown on the family estate. Ficklin Vineyards (brand name). Who is the target audience for your Company/Business/Farm? Wine consumers across the United States. Distributed in all major metropolitan areas, as well as a Tasting Room open 7 days a week for visits. Yes… third generation cousins, Peter Ficklin is winemaker and Steve Ficklin is the viticulturist. Ficklin participates in the three Madera Wine Trail Weekends (February, May, November) as well as two PortFolio Society (Ficklin wineclub) Release Events (October, April), and other Ficklin wineclub events: Chili Challenge (march); Legacy Vintage Port Release (June); PortFolio Society Harvest Party (August or September); Row 100 Vintage Port Release Event (December). Madera CAN be an agri-tourism destination, and not just with the local wineries… with Yosemite just up the road, and the Bay Area only 3 hours away, it is an easy day-trip to visit the laid back and rural atmosphere that we enjoy here. Ficklin Vineyards supports many local and valley-wide charitable organizations through wine donations, tasting events and support of auctions. Many of these organizations have a direct impact on the local community. Through participating in the Madera Wine Trail Weekends, there are people coming to Madera from all over the state. They stay here, eat here, and buy their gasoline here. This can only help the local community and businesses. Continued growth and success on the path well established before us by previous generations. As the wine business has changed through the years, with much consolidation of brands and distribution, it becomes more difficult for family winery operations to remain viable. Those family business need to remain flexible and find those things that work well for their model. Ficklin Vineyards supports agri-tourism, and has moved in that direction to address those changes. Yes – the political strategy and powers that somehow drying up the Westside needs to be changed. The environment and sustainability shown by agriculture needs to be promoted further. Cycling with Parker’s Team; driving with the San Joaquin Valley Miata Club. Local Political representation is very important – and it’s nice to know the people behind the local organization on a personal level.